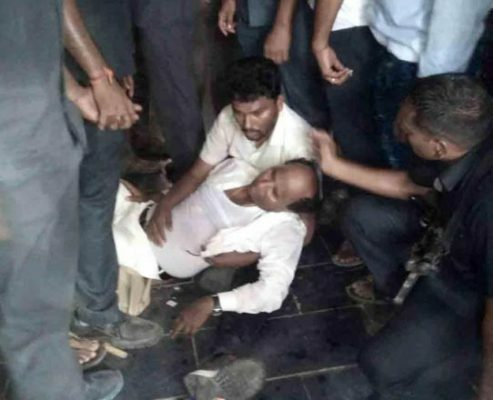 Andhra Pradesh Assembly Speaker Kodela Siva Prasada Rao was allegedly attacked by YSR Congress party supporters in Guntur district of Andhra Pradesh amid voting for the first phase of 2019 Lok Sabha elections, on April 11, 2019. Amaravati: A ruling Telugu Desam party worker and another belonging to the main opposition YSR Congress were killed on Thursday in a poll-related group clash in Anantapuram district of Andhra Pradesh, police said. Countering this, the YSRC alleged that followers of local TDP MP and MLA, the JC brothers (MP J C Diwakar Reddy and MLA, J C Prabhakar Reddy), tried to rig the votes in a polling booth at Veerapuram. Pulla Reddy was attacked with sickles, resulting in his death,the YSRC claimed. Another YSRC worker was also injured in the incident, the party said in a statement. In another incident, Kodela Siva Prasad was attacked at a polling station. TDP has alleged that the YSRCP is indulging in violent acts.